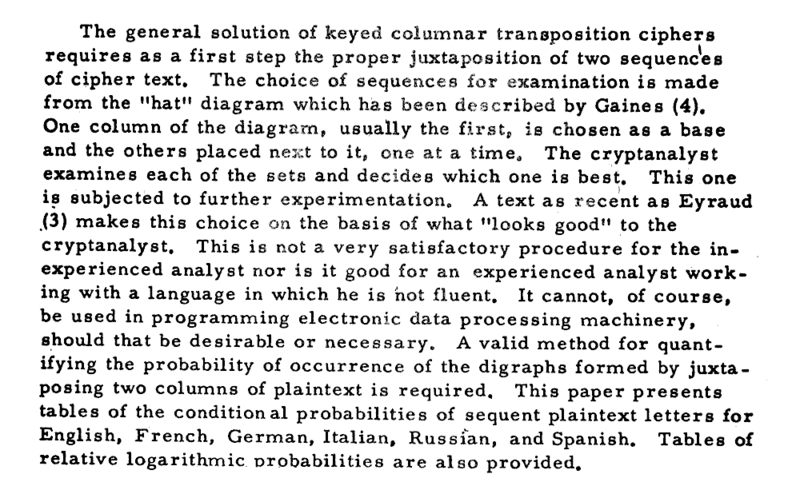 At some point after 1958, the cryptographer Howard T Oakley wrote a paper called "An application of Bayes' Theorem to The solution of Transposition Ciphers". I barely understand the words in it, let alone what they are saying, but I thought that the idea of the following tables, which accompanied the paper might be of interest. They may even be of use, if you are setting about trying to devise a way to decipher things written in something other than English. For a frequency tables for letters in English and other texts, use the link, which will take you to Wikipedia's page, or the one cited later for a fancier table. 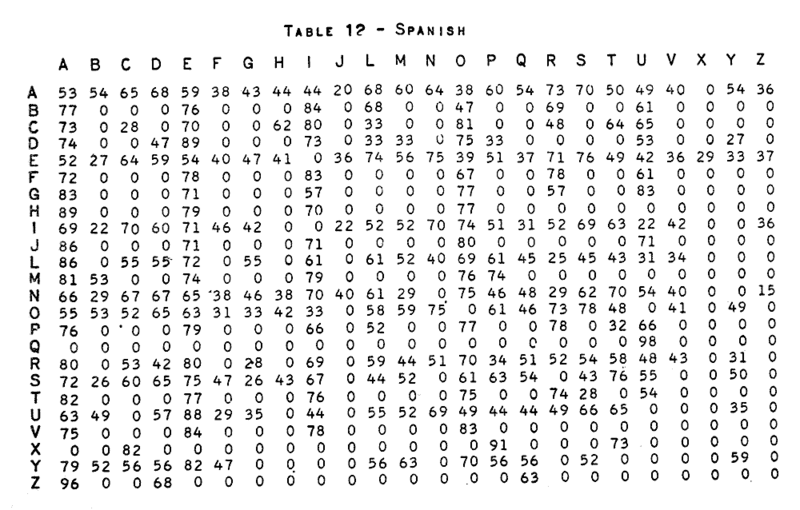 Read on, if you want thoughts on frequency tables, or tables for some other languages. The following tells us something... we'll come back to that... about the of frequencies of letters in English. 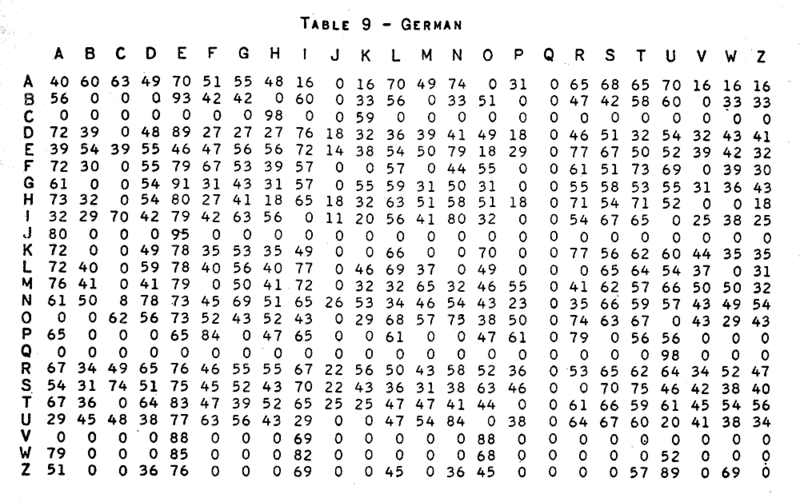 You can treat the question of "What does the table tell us?" as an exercise for your "code breaking" skills... and if you want to be a code maker, few things will make you stronger, faster, than "going to the Dark Side", and trying to think, "How would I break that?" So. 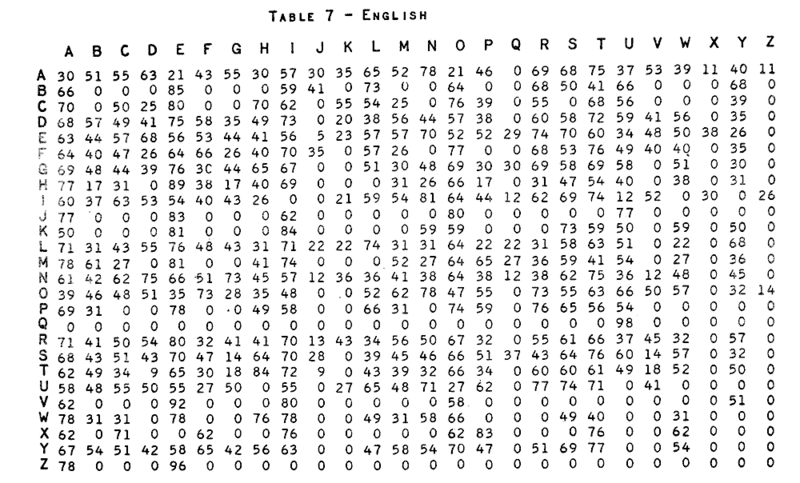 The table has something to do with frequencies of letters in English. Obviously, not the frequencies of single letters. Pairs of letters? How do we read the table? Read no further until you have thoroughly digested the material above, attempted to deduce how you read the table. Look at the row with "Q" at the left hand end. Every column, other than the one with "U" at the top has a zero in it. Ah! Q is (almost) always followed by a U in English. I hope you now see how to read this table of the frequency of letter pairs in English? Look at the row for B. Apparently, B is rarely (if every) followed by B, C, F, G, H... W, X or Z in English. And we can "decode" something else: This table isn't using percents. Otherwise, all of the numbers in the "B" row would add up to 100, wouldn't they? But I believe you can use the table at least to the extent of saying "big number, frequent occurrence". 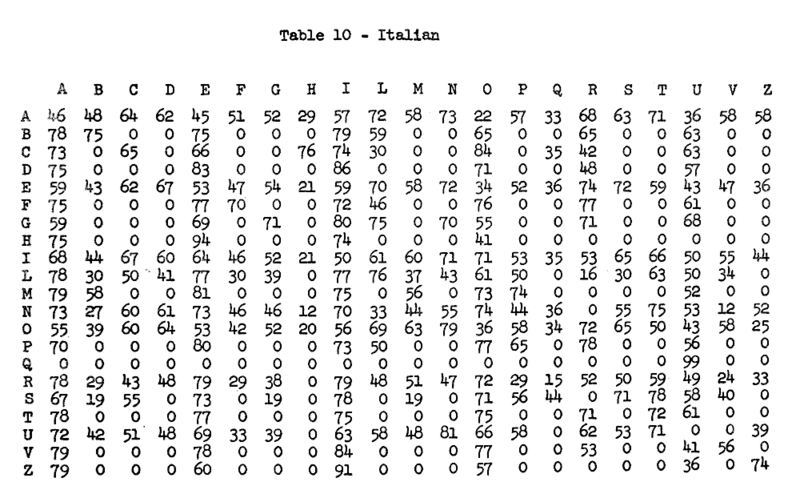 The really obsessive among us will have fun seeing how the Italian and Spanish tables are similar, and somewhat similar to the table for English "sequent plaintext letters", as the essay calls them. Letter pairs, I might have said! The German table comes next, for contrast. And then there's the Russian, which highlights the fact that not every language you might want to encrypt uses the "normal", "Latin" alphabet! Although of little use for any serious cryptographic need, a simple substitution cipher can be fun in the way that jigsaws and crosswords are fun. And if you are learning computer programming, you can have fun writing programs to encrypt text, and other programs to "administer" the breaking of text encrypted that way. Once you've made a few informed guesses about what character might stand for "e", etc, you can then look deeper into the patterns in the encrypted text. The letter following an e is not, unfortunately for us, as "regular" as the letter following a q. Also, the frequencies in a small sample (the text you are decrypting) won't exactly match the frequencies in a larger sample. But all is not lost! From the lovely letter frequency table provided by the University of Illinois Mathematics Department, we can see that the letter following an e is likely to be an r, a d, an n or an a. And, equally useful... if you use it... unlikely to be in the set j,k,q,u or z. What about the letter before the e? The table (read the column under the e) tells us that h is highly likely... even in a small sample, I would guess that the h is detectable, with r also a strong candidate. After that, it is less easy. l. m. n, s, t and v are all candidates. In the previous paragraph, leaving out the references to single letters, a quick scan suggests that e was preceded by h 6 times. Sadly, it was also preceded by t 6 times, and l 6 times. But after that comes r at only 3 times, and five other letters even less frequently. There's a snag in using the tables, unless they were compiled taking that snag into account. If you look, say, at the frequency of h's before e's in English words, you get one number. But when breaking encryption, we don't usually know where the words start, so we would prefer tables of the frequency of letter pairs in English text. In "The cat sat on the mat", the second sort of table would add a count for each of the following, wouldn't it? "ec", "ts", "to". "nt" and "em". That h comes before e very frequently is less surprising when you remember the fact that "the" is a very common word. Patterns like this are the basis of many "tricks" for breaking encryptions, be they simple substitution ciphers, or more complex techniques. 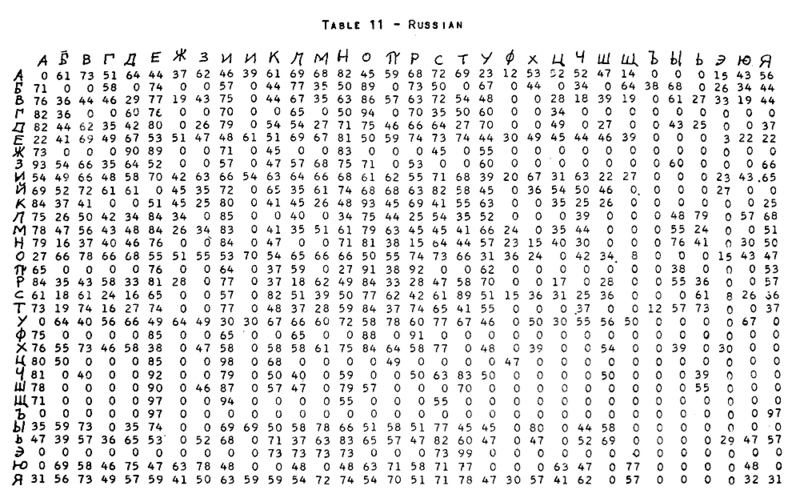 We've looked briefly at some tables of the frequencies of letter pairs in various languages. 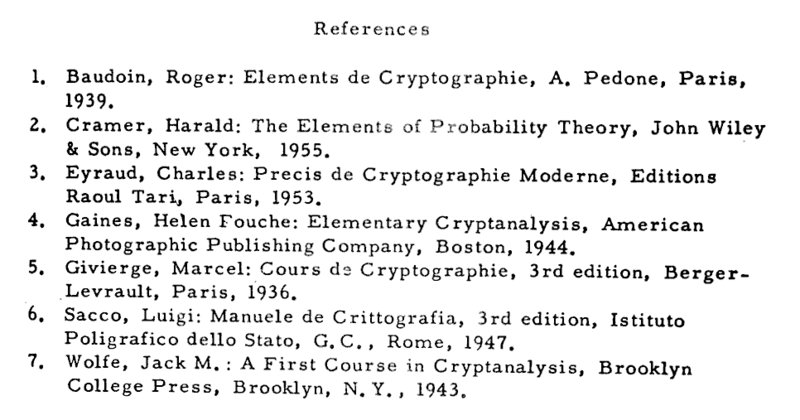 Such tables help cryptanalysts. Cryptanalysts also have tables of the most common letter, pairs of letters, tri-glyphs, at the start (and end) of words (and sentences). They have tables of common (and, almost as useful, uncommon) tri-glyphs. That's about it, for this page. May I invite you to return to, or go to, the main Flat Earth Academy page on cryptography, ciphers and codes? If you came here by clicking on the link there, you need only close this tab or window... the main page is underneath this. Letter frequencies and code breaking- Flat Earth Academy page.